(Screenshot by The Salt Lake Tribune) A video purporting to show an explosion that destroyed an arch in Utah recently appeared online. Utah investigators say videos purporting to show vandals blowing up an arch and hoodoo are fake. The videos, which were posted online last weekend, were reviewed by the Intermountain West Regional Computer Forensics Lab in Salt Lake City, according to a news release by the Utah Department of Natural Resources. “It is the opinion of the lab that the videos are more than likely computer generated, and therefore, fake,” the release stated. 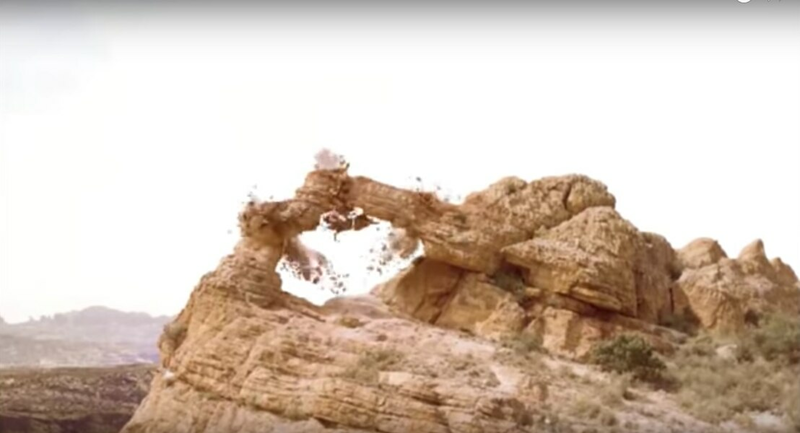 The video also was reviewed by state parks officials, DNR employees and geologists from the Utah Geological Survey; none of the observers was able to identify the rock formations in the two videos. “While the experts believe these videos are fake, the fact still remains that many of Utah’s natural resources are damaged from careless and irresponsible act of vandalism and destruction,” the release stated. "These acts include spray painting over rock art, carving into sandstone and outright destroying natural rock formation. In these cases, those involved are demonstrating poor judgment and disrespect. The videos showed a large hoodoo and a natural arch exploding, with onlookers counting down and laughing. Although the videos quickly went viral, shared by outraged viewers, special effects experts told The Salt Lake Tribune there were multiple telltale signs of digital manipulation in the footage. Hikers and photographers with extensive experience in southern Utah said it was unlikely that such distinctive formations could be unknown to the many adventurers who have explored the area. And one hiker identified uncanny similarities between landscape features on the videos' horizons and those seen from a popular viewpoint at Arches National Park, where no formations have been reported to be destroyed. That hiker, Jamal Green, said he believed the digital explosion was overlaid onto a still image of the landscape in Arches.